I have recently started using the ARGAN & YLANG YLANG MOISTURIZER and I really love it. I have super sensitive, combination skin AND eczema and I was deathly afraid I would break-out or react badly and become all red and itchy. I am so happy to announce that after 2 weeks of use, I have not broken out, my skin is soft and pretty and smells lovely. 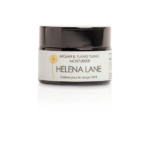 I have wanted to make the change to all natural skin care for some time now and have tried many (expensive) products, my sister in law introduced me to Helena Lane and I am loving everything I have tried so far. I am also really happy to support a company that is good for our planet – both environmentally and ethically. My love for this product took me by surprise. I initially only used the cleanser, flower water, and serum. I have oily skin why would I ever use a shea base cream?! I received a sample with one order (and have since re-ordered a full size) and tested it out only to find that it’s AMAZING! My skin feels so soft, so happy, and the smell is very mild so it doesn’t bother my sensitive nose. I feel like I just upped my skincare game by adding this product into my portfolio. No more adult acne, angry scars, or mid morning oil slick! This cream feels amazing rubbed into cuticles as well! i started using the argan and ylang yalng moisturizer back in december, when i realised that canadian winters were much tougher than english ones! my skin was dry, unhappy and very reactive to both indoor heating- where i was turning bright right- and the icy temperatures outdoors. i had never used anything with a shea butter base before, always worried it would be too oily and bring back the terrible acne i had in my early twenties. i can not believe how wonderful this product is. aside from the fact it smells wonderful , it feels amazing on my skin, keeping it looking and feeling so healthy and hydrated. i react to ABSOLUTELY everything and to find something natural and effective and, quite frankly, very reasonably priced that i can use without the risk of an allergic reaction has been brilliant. i don’t think you can underestimate how much skin troubles can really, really affect your confidence as a woman- or man- and i feel like finally, after twenty years of searching, i have found a great brand that is ticking everyone box that concerns me- natural, organic, ethically sourced etc. i absolutely love this moisturizer and would recommend it to anyone who normally finds it tough to find a product that really helps dry, reactive skin. 100% happy I switched over my entire face care regime to all helena Lane products! I use this moisturizer paired with the lavender and lime cleanser as well as the white willow exfoiliant and it has changed my life. Not only has it cleared up my cystic acne but has brightened my overall mood! Thank you so much for creating these wonderful magical products! This moisturizer is a gem! 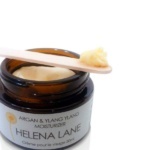 I was struggling with adult hormonal acne when I came across Helena’s products and they have all been a lifesaver and have made an unbelievable difference in my skin. This moisturizer in particular is so hydrating and leaves my skin feeling incredibly soft. It smells like a garden and I really think it has helped reduce fine lines on my forehead and my acne scarring. Thank you, Helena!